I didn’t get out much this week due to all of our illnesses and also because of the weather. Ughh…it’s so chilly! Up until lately, we’ve been spoiled with unusually high temperatures, so our current weather is kind of a shock. Yesterday, despite the alluring look of all the bright sunshine, it was ten below outside with about a minus thirty degree windchill when my son left for school. The Mister drove him…I stayed in. Luckily, I did manage to get out for a bit the day before. Feeling like I needed a dose of some brightly-hued beauty, I picked up a bunch of flowers while out and about on a much needed trip to the grocery store. I decided to combine them with a little of this and a little of that, take some photos and finally put together a post. Besides having a keen eye for spying flowers, I’m always on the hunt for interesting little tidbits…some things old, some things new. Since I’ve been doing more and more food photography, I have a new-found love for kitchen-related items, fabric always calls out my name too. But what I really like, is when I find an item a little out of the ordinary, something that has a hint of charm and feels nice and natural too. I love worn woods…things with texture. Mmm, yumminess. If I remember correctly, I think I scavenged these wooden spools from Mom’s house along with some vintage clothespins. Weird little things like that make me so happy. I especially think they look so pretty paired with a few beautiful blooms. I could spend ridiculous amounts of time rearranging it all and enjoy every minute of it. Speaking of rearranging, there are a few little projects I’m hoping to get done around the house soon so that maybe I can have a decorating post for a change. Hopefully, I can work on one of them this weekend…fingers crossed. Oh, one last thing. If you are still having problems leaving blog comments, I’ve noticed two things…it seems to randomly happen on blogs where the comments are embedded under the post and also the browser you use appears to make a difference. I downloaded Google Chrome and now all is well. It only took a few minutes and I can still use Internet Explorer whenever I like too. Maybe that will help some of you that are having the same problems that I was. Well, my friends, have a great weekend! Oh so lovely colors! Makes me think of spring. Happy to hear you are feeling better! OMG…that Anthro bowl is my fav. I love love love how you style your shoots! I am totally swooning over here! I love flowers string spools keys & any colour of bluey turquoise! Your post is beautiful! Hope you are feeling better, we just had a week of snow! I lived in Minnesota for a year & you guys surely have cold weather!! Thanks so much for the info on Chrome, I am scared to switch, but you have given me courage! Love your photography! I always enjoy visiting your space for some uplifting and very inspiring ideas. Glad you're feeling better. I'm just getting over bronchitis myself. Here's to a healthier new year! You should have a career shooting for a magazine! These are such cool pairings. I love the muted background tones and vintage items paired with the bright, colorful flowers. Perfection. Gorgeous blooms and photos!! Glad you are feeling better Tricia!! Have a wonderful weekend and stay warm! Sorry you have been ill. Great pics and I switched to Chrome, too. Much better with that browser. Have a great and Feel Better Weekend!!! 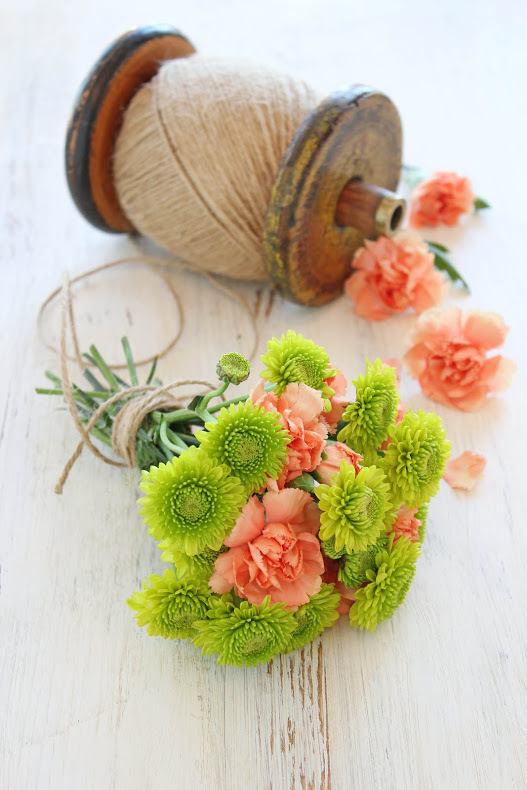 I love the pairing of the lime & mint green with the peach carnations. Your new fabric looks lovely. I just got in a new fabric shipment yesterday – it is so addicting! 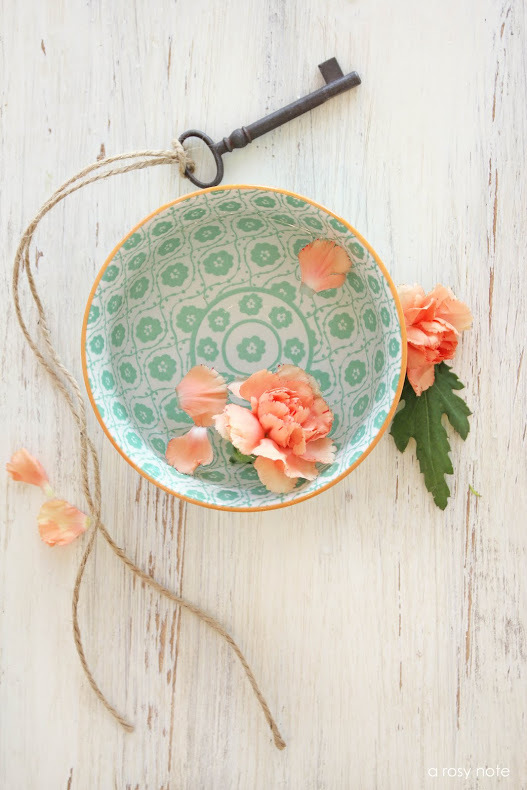 I have that same anthropologie bowl – one of my faves! Sorry you had the bought with the bug. I have started drinking kefir to prevent getting that virus – total germ phob here! 😉 I was in the peditrician's office yesterday getting pink eye drops for my son – it takes 2 to pin him down to put them in! Enjoy the weekend! I'm so happy your feeling better! Those flowers are so beautiful, this post makes me want to go to the market and get a bundle! 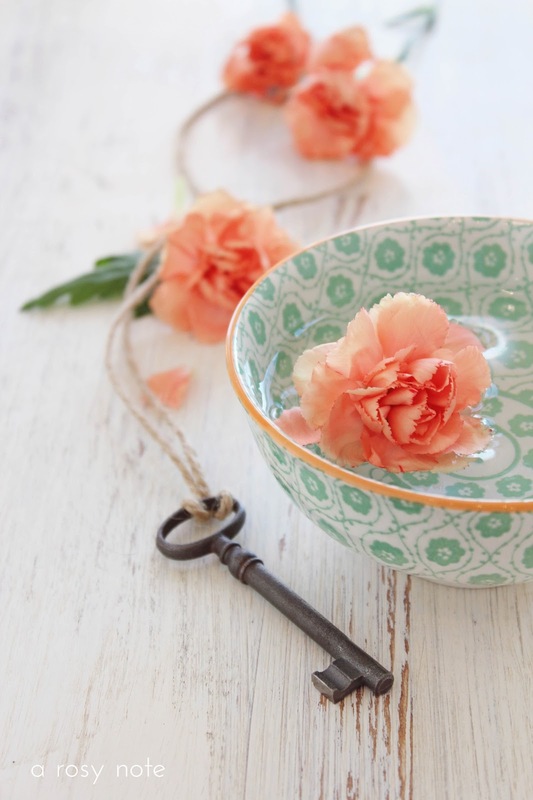 So pretty Tricia, love those pops of color to brighten the cold, cold winter, and the bowl is very cute too! Sorry to hear you've been sick, Tricia…no fun! I'm glad you are feeling better now! These photos are just beautiful…the colors ARE so wonderful to look at with this cold snap. You're right~ this weather feels much colder than it normally would after all the warm weather we've had! Anyway, these colors and prettiness are like a sight for sore eyes! Hope you have a wonderful weekend! glad you're feeling better. the colors in your beautiful pictures are just so fresh and pretty. always gorgeous! talented lady you are!! love the cabochons….i want a bright bracelet made of them!! What a wonderful tones … Gorgeous ! Absolutely gorgeous photos! They are a breath of fresh air in the middle of winter! So lovely! Great colors! I am pinning those to my inspiration for my art board! Beauty indeed. I love the bright colors of the flowers and the bowl. And that spool is just darling. I'm so glad you are feeling better. From the title of the post I was expecting to see a photo of some bugs…. Gorgeous pictures! I have been wondering about Google Chrome. I think I'll have to try it. Blogger just changed the comments so that those people with embedded comments can respond to another comment directly, so maybe it's still buggy. Tricia…You have such a gift. Hope you are feeling better, no fun to have the flu. Our weather seems to be the same, cold yesterday, snow today. I switched to Chrome a few weeks ago, but do all of my blogging in Firefox, for some reason I have more posting options in Firefox, like changing picture size once the picture is uploaded…go figure. Anyway, Happy Friday. Tricia, you never cease to amaze me! I love how you style your photography! Your images are such a gift to all of us! these are so beautiful! I love the wood table top you use as a background. I have a wood platform I use to shoot on but its not as wonderfully rustic looking as yours! I need to find something like that! These are lovely. I'm happy you feel better, I always need your photos for inspiration. Wow Tricia!!! The bright colors look absolutely springy!!! Sorry to hear you were under the weather 🙁 Have a nice weekend! It's amazing how you can take "a little of this and a little of that" and make it all come together. Beautiful. Beautiful pictures makes me think of SPRING!! Have a great weekend! your blog is so beautiful. i spied it on molly's (birdie blue) thumbnail and popped right over. glad to find you feeling better and taking such lovely photos! I ♥ all of these shots!!!! Your blog and your photos leave me with such an "ahhhhhh" feeling! I have a thing for keys, and I collect them and so i'm drawn to those shots and you've given me a few inspirational ideas…thank you. I wish you health and nice weekend! Happy to hear you're feeling better too. Stay well! Oh, Tricia! Your photos are such a breath of fresh air….a delight to the eyes! I am going to buy some tulips today….now if I just had some wonderful natural light as you do. You have such a wonderful sense of design—and photography! HI Tricia~ Love the bright, happy colors of your flowers:) Sounded like you needed it. Glad to hear you are feeling better. 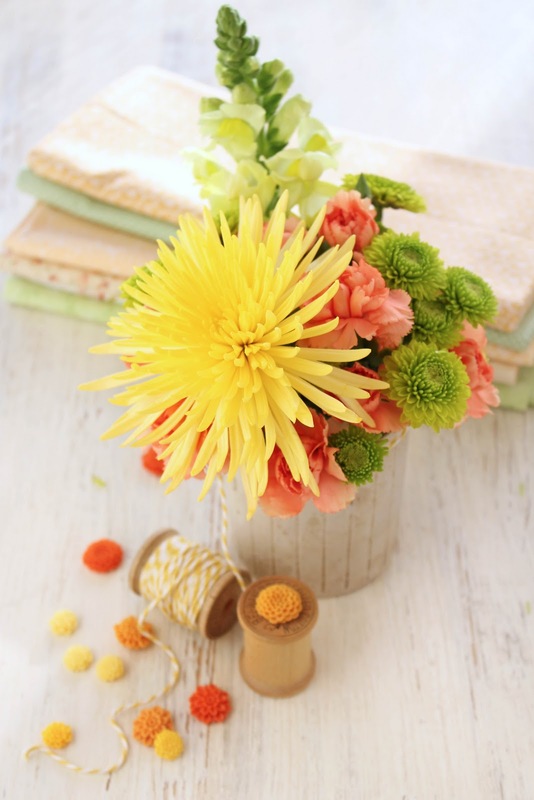 Love your vibrant yet soft colors, and of course the lovely flowers! Lovely photos. Like that big spool with the twine on it. Sorry you've been sick, and glad you are feeling better. Playing with flowers and pretties is one of my favorite things to do, especially this time of year. Your photos are so pretty! Those colors make my heart sing!! I can't wait for Spring and all it's glory. Thanks for stopping by.. I hope you get to relax. Your images are always a delight to my eyes! Love all the beautiful textures and vibrant colors!!! 🙂 I hope you feel better – unfortunately, I'm sick yet again! 🙁 And I noticed the blogger comment prob as well, and changed browsers. Alrighty my dear, take care and enjoy your weekend!!! Your photos are lovely(as always)and the flowers are so sweet. I hope you are feeling better. I'm down with the flu too. I had it at Christmas and got better and it came back on me last week. For some reason many seem to get it twice. Wonderful, beautiful photos…so pretty. Perfectly designed and put together compositions. I have been forced to use Google Chrome some too, but I still favore Internet Express, probably out of habit. Amazing photos , great combination of colors and great styling. I love all the single charming things here and of course , your fabrics.The vibrant colors are so uplifting and cheerful, aren't they .I am glad you are feeling better . Have a joyous weekend, Tricia , no matter the wether. These are absolutely among some of your finest photos, Trisha, how utterly gorgeous! I've run out of words to describe the beauty of your photographs! I love the pretty yellow and white twine, others have been using red and white but this yellow is so charming. Such a quiet softness and springtime feel to these photos. I hate the flu. We never have enough bathrooms when it hits! I hope you're feeling better. I enjoyed your beautiful photos! We've been using Google Chrome for a few months now, and have much less trouble. These are definitely among my favorite images of yours, Tricia. 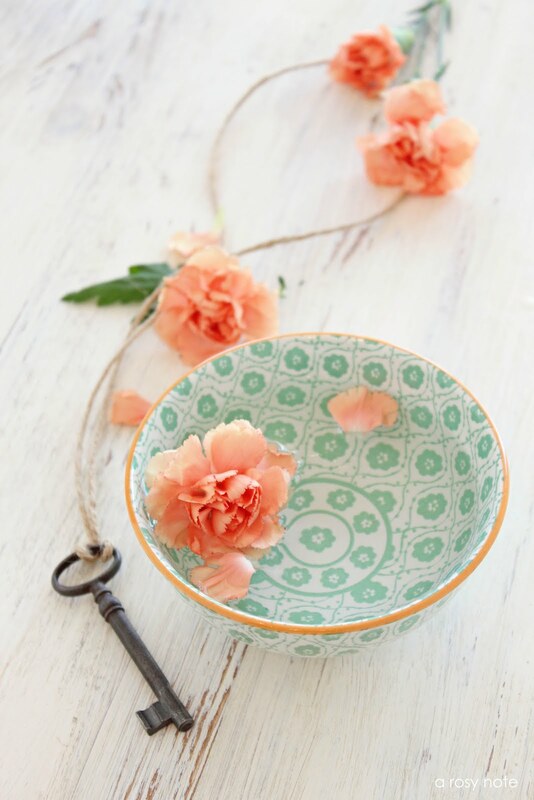 The overhead image with the key and bowl is gorgeous – perfect color harmony! I'm so glad you are feeling better. Wishing you a wonderful, restful weekend. such beauty!! I just LoVe your style! Reading and looking at your post is like peeking into the pages of a magazine. So, so lovely and just the right blend of beautiful colors and vintage items. I want to take lessons from you on setting up vignettes. truly beautiful. i saw and read yourt article in artful blogging and was hooked!! God bless and pleae drop by sometime! I am so glad to hear you and your daughter are feeling better and sharing your lovely photos with us.. They always brighten my day!!! thanks for your comment, your pictures are so lovely, i feel like in summer, BEAUTIFUL! What a simply pretty post full of inspiration! glad you're feeling better! yuck 🙁 and hopefully this blogger stuff gets worked out quick! Hi, i've come over from Mira Crisp's blog. I wanted to say that I really like your photography. The light that you capture is so soft and gentle. Just lovely!!! Gorgeous colors Tricia – I love the bright green and peach against the grainy washed wood…beautiful. I am so sorry to hear ya'll were sick! We've had our fair share around here too, it's just that time of year I suppose. I wish I had lost 4 pounds though. Darn it! You are such an amazing still life photographer – I gasped as I scrolled down the page. So lovely, the wooden spool for the twine is my favorite. Thanks so much for your kind comment on my "contentment" post. I love those bright green flowers. They last for so long too! Such lovely shots. I just bought some of that yellow twine, I love it! Dearest sweet tricia, these colors are just so inspiring and beautiful! I LOVE your settings so much!! Beautiful photos that warm my heart! Have a lovely merry happy sunday and a wonderful Luna New Year! Love to you! You should publish your own magazine! I've never known what to do with those green flowers; you've paired them beautifully! While this article deals w/Facebook, others I've read talks about blogging as well. I love your simple arrangement, the key and the small green bowl. I enjoy every minute I spend on your blog! Your photographs are refreshing and artistic, just my cup of tea! Those flowers are lovely, and your photography is gorgeous as always! You always amaze me, I love the mix of color and textures in that bunch! i love your photography – everything looks so fresh and clean. and i am coveting your little spools of string. i may have to take a trip to my local antique stores for some new treasures. What lovely, lovely pictures! You are such a pro, gorgeous girlie. I remember having problems leaving comments last year and switching to Chrome and it hasn't happened since. Hurrah!! Oh so sorry to hear you and your little girl were so sick. I hope you're much better now. I've heard how cold it's been up there and I pray it will warm up soon. My Momma and Sister and other relatives are in Iowa (the Quad-Cities) so I keep a close eye on the weather to see how they are doing. What beautiful photo's as always! You have such a talent for capturing such beauty. I am loving the antique spool of thread. I also love the distressed looking wood you have them on. I LOVE your orange and blue bowl…anthropologie? Gorgeous colors – gorgeous photography. Love visiting your blog…I just moved to Singapore so I was behind on my visiting. But I am back and enjoying the photos – thank you! Oh my oh my how beautiful, I'm so in love for every picture. 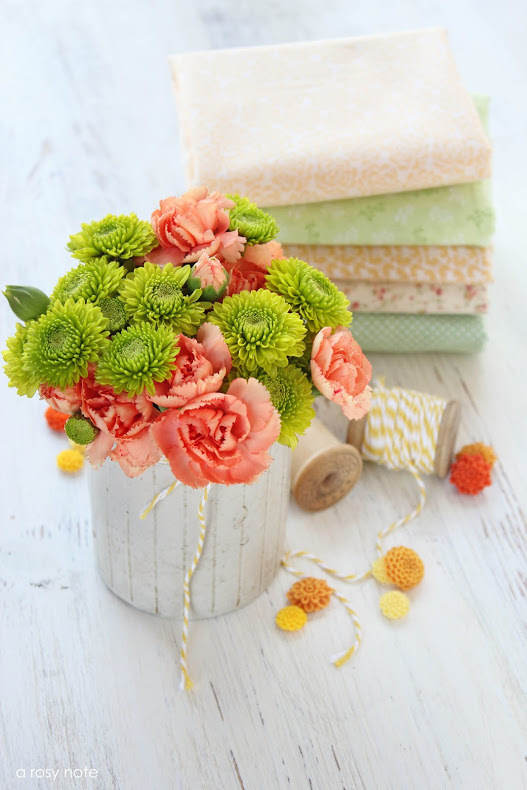 It looks like summer light in pictures and your flowers and fabrics are all in same pastel tones. Every picture looks so clean and fresh, wonderful. Tricia, thanks for the sweet comment about my cute animal pictures. There will be much more to come. I'm glad you are feeling better. You are a master at this, your photos are all just so gorgeous! Love your colour combinations and wonderful props! Your pictures are brillant and wonderful. So bright and amazing.